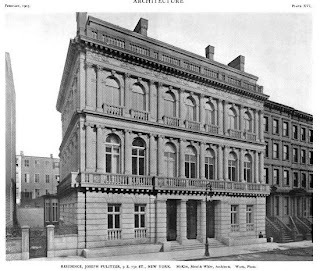 The Joseph Pulitzer residence designed by McKim, Mead & White c. 1903 at 11 East 73rd Street in New York City. Pulitzer, publisher of the New York World, moved to this location after a fire at his residence on East 55th Street. The building is now a co-op. Click HERE for more on the Pulitzer residence and HERE to see it on google earth. Photo from Architecture, 1903.